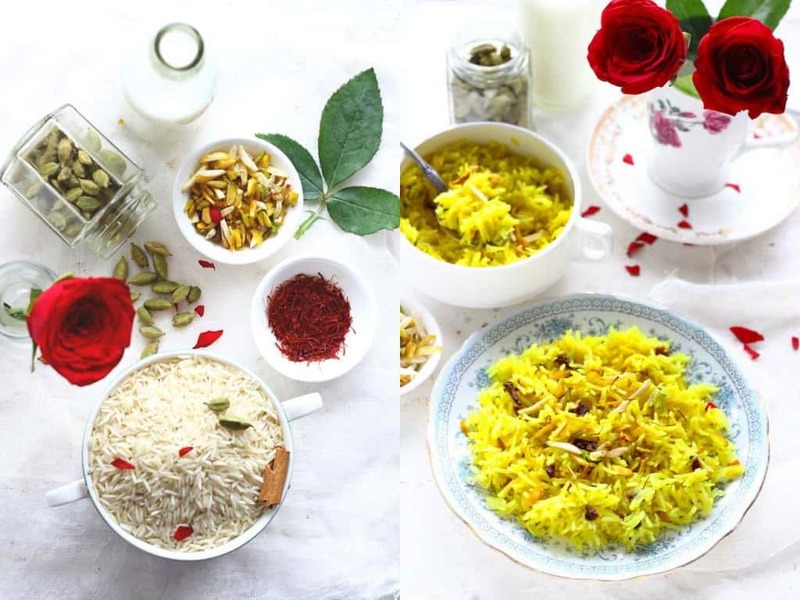 Meethe Chawal or the sweet pulao is considered one of the most auspicious dishes to celebrate the Indian spring festivals such as Baisakhi and Bengali New Year. The earthy taste of whole spices and the sweetness of saffron make this Indian sweet rice a perfect melody of flavors. 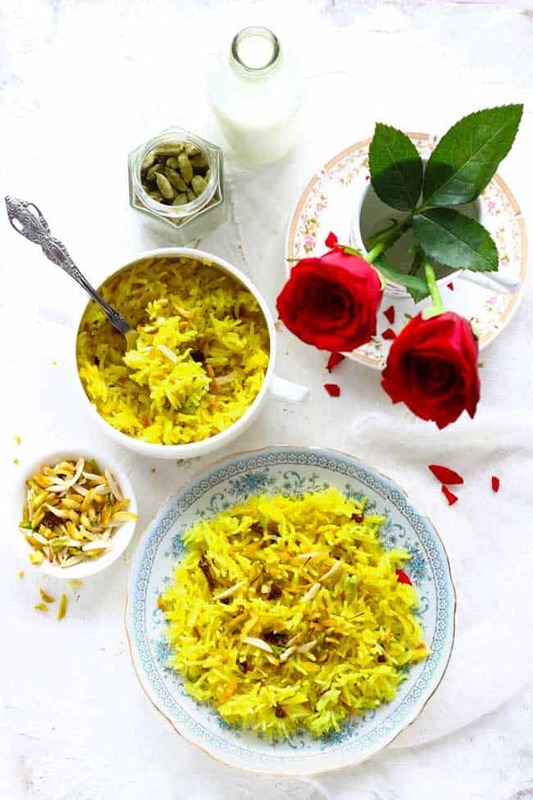 As per the folklore, it is considered a good omen, to combine yellow rice with sugar and serve it as a sacred offering to the deity of the family. 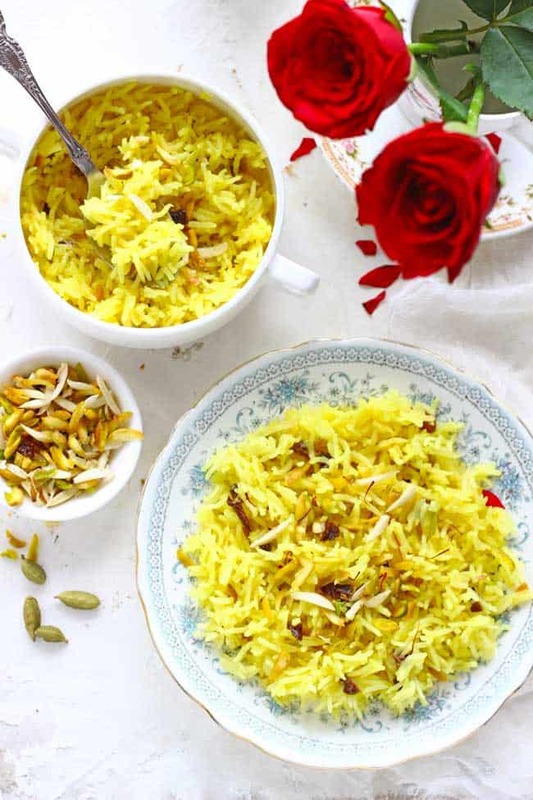 Desserts made with rice are widely popular in India and this unusual version of sweet and savory rice is a specialty prepared on certain festive occasions. 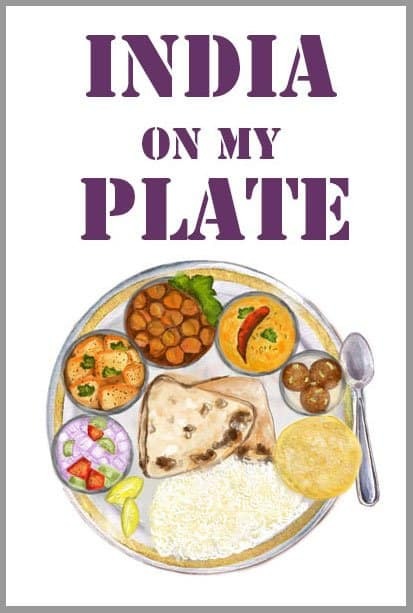 The dish has different regional names – mishti pulao, zarda, sweet rice, meetha pulao. All these regional names refer to a decadent and aromatic rice dessert. 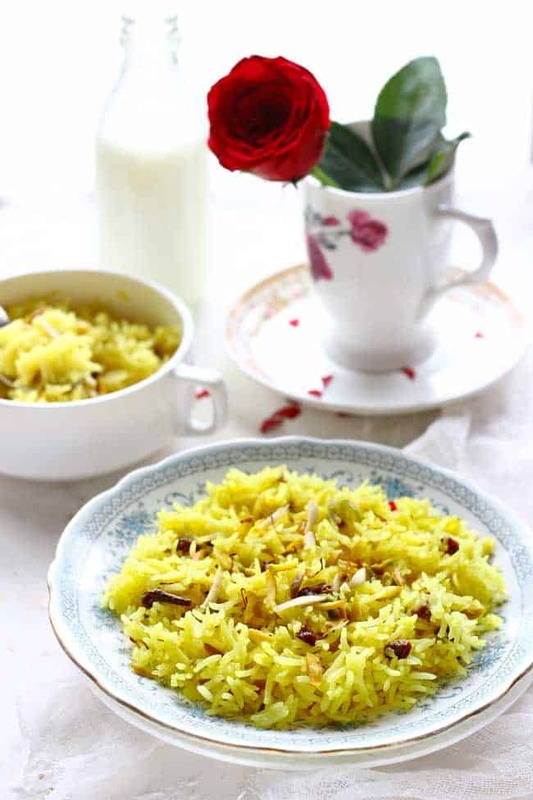 Enriched with the aroma of saffron and cardamom, this zarda pulao is the fitting end to a conventional Punjabi meal. Don’t forget to garnish Meethe Chawal with a generous amount of almonds and pistachios before serving. This Meethe Chawal Recipe is just in time for the festival of Baisakhi. The harvesting festivals of India celebrated across the nation with different names. So we have more than one reason to celebrate the shades of yellow. And this time of the year also set the mood for the forthcoming spring season. It’s the moment to shed the layer of woolens and step outside to bask in the glory of bright, sunny days ahead. Always make sure to use long grain good quality basmati rice for making the zarda. While cooking rice for zarda, make sure it is not mushy or sticky. Hence, it is best to cook it in a wide heavy bottom saucepan. After cooking the rice for sweet pulao, allow it to sit on a colander for a few minutes to drain all the water from the rice. This step helps in making a perfectly fluffy zarda. Many recipes suggest adding food color, but I stick only to saffron and a tiny bit of turmeric. 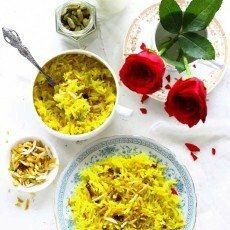 To make Zarda pulao more rich and indulgent, one can add grated khoya (mawa), orange zest, fried coconut, edible rose petals, and chironji. How To Reheat Meethe Chawal (Zarda)? Microwave Method: The best way to re-heat meethe chawal is to microwave the dish for 5 – 6 minutes covered. Transfer the sweet rice to a microwave safe bowl, cover the bowl with a lid, heat for 3 minutes, stir the rice using a fork and once again heat for another 3 minutes. This way you will get perfectly warm sweet pulao. Gas Stove Method: Transfer sweet pulao to a heavy bottom frying pan. Sprinkle 1/4 cup of water over the rice. Then, close the pan with a lid and heat over low flame for 3 – 5 minutes. Don’t forget to stir the pulao halfway through the heating time. For more such fun recipes in your life subscribe to our Youtube Channel. Meethe Chawal or the sweet pulao is considered one of the most auspicious dishes in Punjabi Cuisine. 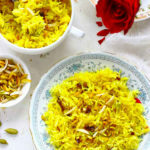 Learn how to make zarda pulao in few simple steps. Clean, wash and soak the rice for 15 minutes in water. In a large saucepan ( buy it here ) add soaked rice, cloves, cardamom, bay leaf, cinnamon stick, salt, saffron strands, turmeric powder, and water. Stir to combine. Cook till the rice is parboiled (halfway cooked through). Turn off the heat. Drain the water from the cooked rice and let it sit on a metal colander. Remove the whole spices. Heat ghee in a heavy bottom wide skillet ( buy it here ). Fry the dry fruits for 5 - 10 seconds in the ghee and transfer half of them to a bowl. Add milk over the remaining dry fruits, stir and cook for 1 - 2 minutes or till it reduces a bit in quantity. Next, add the prepared rice and spread it evenly. Add sugar, fried dry fruits, and saffron strands. Close the skillet with a tight-fitting lid. Allow the rice to cook and absorb the flavor of aromatics at the lowest heat. Cook the rice this way for 5 - 10 minutes. Turn off the heat. And do not open the lid of the skillet until you are ready to serve the sweet pulao. 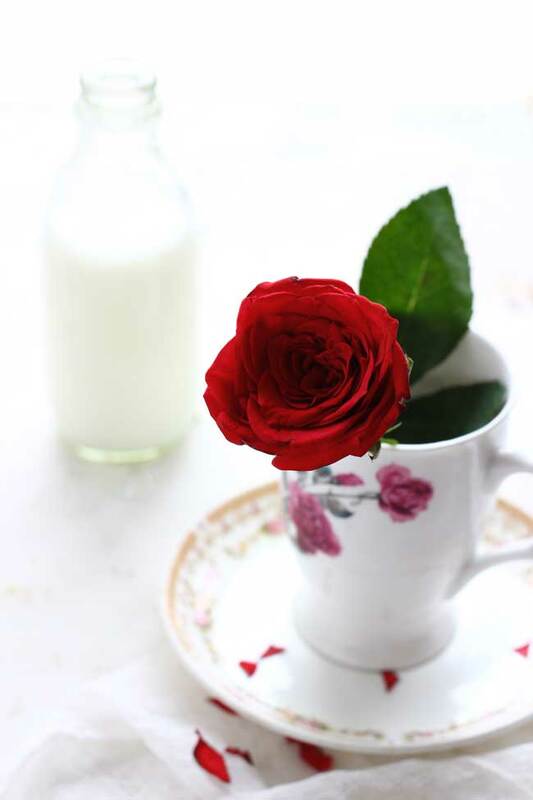 Open the lid of the pan, gently fluff the rice using a fork and garnish with rose petals.